Do you ever feel that life is just hurtling forward? Going 100mph, with such force, you’re screaming for it to stop. Let me off. Please just pause for a second. I sometimes feel it is so hard to live in the moment. I don’t know whether that is because of integrated technology as I’ve lived with it for most of my life, but part of me suspects so. Sometimes I wake up already in a crap mood and sort of wander through the day and before you know it the week is over and I flop into bed, like what happened these last few days? Living in the here and now if incredibly important, but it’s also important to make sure you have the best possible day too. I’ve written before here on the blog about anxiety and so I’m here to share with you a few tips and tricks I’ve picked up along the way to uplift my day, and now hopefully yours. Ok you might be thinking right now, what on earth, but let me explain. Go up to a mirror and do something silly. Pull a really stupid face, bust a move, and try your best Beyoncé impression… that made you smile right? I start each morning by doing something silly that will put a little smile on my face, a little giggle to myself. Just that little moment of silliness uplifts my mood and as I walk out the house it’s like my little funny secret, you know the one where you privately smile to yourself when you remember. Take a break and just sit. It’s incredibly important to just slow down. No I’m afraid you can’t get off the world, but you can slow down. My favourite thing to do is go to a coffee shop, order a drink and just sit. Put down the mobile phone (I’ll get onto that) and just relax. Sink into the chair, look around you, take in what you see, and switch off thoughts about that deadline looming, or what did Lucy mean by that comment last night. None of it matters if you are not enjoying your life. I love coffee, I really do, but I’ve started cutting back on it as it has a wired effect on me, which isn’t very good for slowing down. Instead I’ve taken up tea. Now if you watched my 50 things about me video, you’ll know I hate milk, which is why I’ve loving the Starbucks Teavana iced tea. 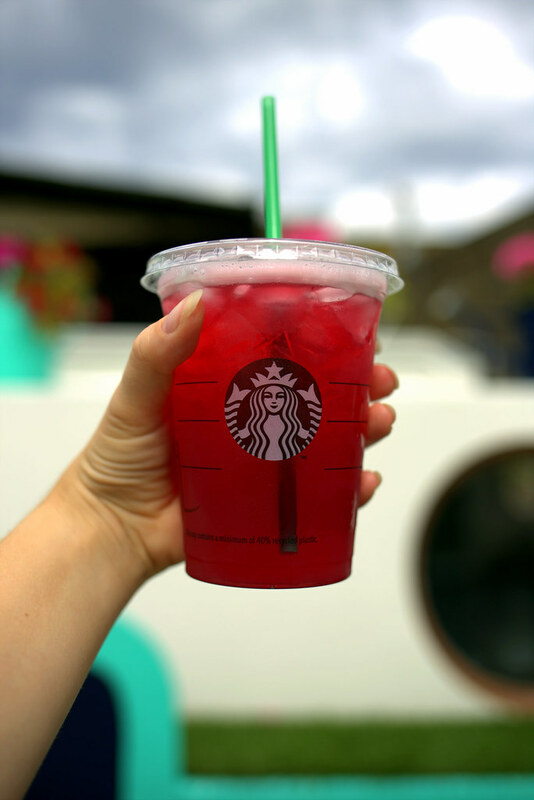 Personally I love the Iced Lemonade made with Hibiscus Tea. It is so so good. I always thought tea was a bit of fuddy duddy but if this is what tea is like, I could get used to this! So refreshing which is a great way to relax, but with just the right amount of zing to just perk up my day. I said at the beginning how I think technology might be part of the reason why we sometimes feel like we aren’t living in the here and now. How often are you trying to take the perfect photo for Instagram somewhere, when the actually event is passing you by? I’m certainly guilty. Did you know the average person checks their phone over 160 times a day? That’s mental! So I try to have technology detox time. Put away the phone, the laptop and whatever else and go for a walk. Discover what is around you and what quirky things you might see. Take a hot bath, sit outside, or take a bike ride. Do something that lets you just experience what is around you right now, and not what other people are doing on the web. This might seem tedious, but at the end of the day I like to write a few notes down. Maybe something cool that I discovered today. Little observations, things I noticed or feelings I felt. Your mind can’t remember everything, but paper can. Sometimes when a day feels really rubbish, it forces me to realise that it wasn’t all bad, and I get that little uplifted feeling. I like to reflect on what I have done, what I have achieved and what I am grateful for. Being grateful is a wonderful way to uplift your spirit. It makes you realise that people care for you, have done some act of kindness or that there is goodness in your life. And that is a wonderful realisation. What do you find helps you uplift your day? And have you tried any of the tea range from Starbucks? Let me know below. This post is sponsored by Starbucks Teavana range, but all words, views and ideas are my own.